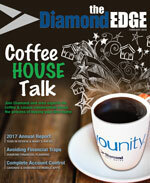 The Diamond Edge newsletter brings you all the latest on Diamond in the community, new products and services, promotions and more. The Diamond Edge is produced three times per year in February, June and October. Plus, enroll in E-Communications and have the newsletter sent automatically to your email inbox. Fall 2016 – Computer and Tablet and App, Oh My! November 2014 – YOU ARE HERE! – Products for every phase of life. July 2014 – Online & Mobile Banking UPGRADE! That’s younity! February 2014 – A Day in the Life – Simple steps to protect your identity. 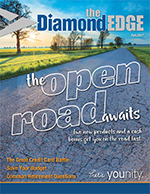 October 2013 – Be Prepared for the unexpected and pay less. July 2013 – Business Services – We’re In The Game To Help You Win! 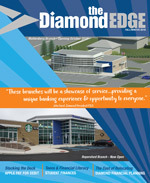 Receive The Diamond Edge by Email! 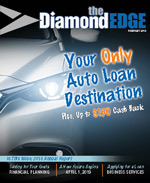 In order to take advantage of Diamond’s full array of products and services, a Member Share Account must be established with a minimum deposit of $5. You can then open accounts along with your membership application or through NetBranch Online Banking.